Sarah first joined the Marine Geospatial Ecology Lab in September 2016 as a graduate student and her work has focused on the Migratory Connectivity in the Ocean (MiCO) System with the Sea Turtle and Seabird teams. 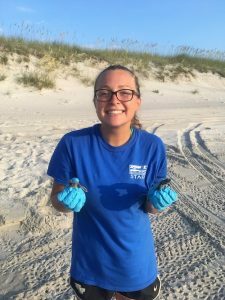 After graduating with her Masters in Environmental Management from Duke in May 2018, Sarah joined the lab full time to focus on the continuation of MiCO and applications of the system for sea turtle area based management. Sarah’s main interests lie in movement and behavioral ecology and marine spatial conservation for marine megafauna species, particularly sea turtles and seabirds. Prior to working with MGEL, Sarah earned her Bachelor of Science in Biology from Wake Forest University, spent many hot days and nights with the Sea Turtle Conservation and Research Program at Mote Marine Lab and their beach patrol and monitoring team, helped in the rehabilitation of hundreds of cold-stunned sea turtles with New England Aquarium Rescue and Rehab Center, and worked on a wide range of wildlife conservation projects and environmental education programs for thousands of visitors to the Bald Head Island Conservancy as a Coastal Specialist.